First visit fix rate: What is it, and how does it affect you? All trucks require maintenance sometimes, especially in high-intensity materials handling operations. The important thing is how quickly you can get the truck back in operation afterwards. This is where your service supplier's first visit fix rate becomes important. The first visit fix rate (often shortened to FVFR) is the percentage of service visits where the supplier fixes the truck and puts it back in operation without needing to return for a second visit. This kind of visit - where the service engineer can solve the problem or has the required part on their first visit - is the most effective way possible of solving the issue. The percentage of service visits which result in a fix on the first visit can have a big effect on your business. If a service supplier has to regularly come out to you first, then return to their own premises, find or order the required tool or part, then come back to you and carry out the required service, then this will add extra time and cost to the process. The worst part of this is that the truck which requires service will be sat immobile the entire time — and downtime is never good if you're concerned about costs or efficiency. Your fleet is designed to ensure the maximum use of each truck — no-one plans to add trucks to a fleet that won't be used that much. So if one is out of action for an extended period, it makes a tough impact on your operation, and the rest of the business beyond the logistics side. For any service supplier, the higher their first visit fix rate, the better. Even a difference of a few percentage points could have a noticable impact on your performance, especially if you have a large fleet and service visits are more common. 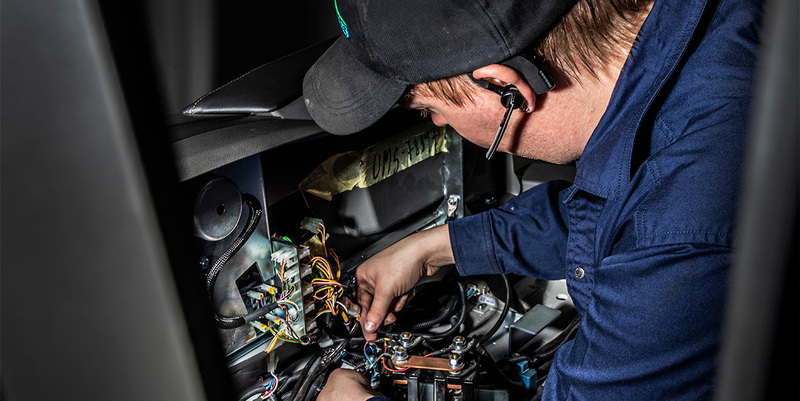 Suppliers like UniCarriers can have first visit fix rates of 95% or above — well-stocked service vans and a truck design with fewer components contribute to increasing the rate. If you want to learn more about what make a good forklift service supplier, click the button below to get our guide, When it comes to service, what should you expect from your truck supplier? You'll learn more about FVFR, but also the importance of service agreements, online ordering and quick parts delivery times.